Thanksgiving is a holiday that I’ve tended to be a guest for, rather than the chief cook and hostess. In addition to my many other blessings, I’m always grateful that I don’t have to be in charge of getting the turkey just right: done, but not dry. For the last couple of years, a local friend (and fellow American) has generously included my family in their family’s feast. I bring a dish or two, usually a dessert within my cooking comfort zone. But other than these Thanksgivings, I can’t recall any but the ones spent at my parents’ home. Did I roast a turkey during the years we lived in Trinidad? Strangely, my mind is a complete blank. The childhood rituals are the ones that stick in my memory. When I was a child, we always celebrated the holiday with my three grandparents – who liked to eat at around 1 pm or 2 pm. My mother had to get up early to wrestle with the turkey, always hoping that it had thawed completely. My paternal grandmother was in charge of the cornbread dressing and the giblet gravy, and I usually helped cut up the fruit (apples, oranges, pineapples, grapes, bananas and maraschino cherries) for the obligatory fruit salad, but everything else fell to my mother’s competent hands. These were the important elements for me: turkey, rolls and pumpkin pie. I didn’t like cranberry sauce or sweet potatoes until I was an adult, and I can still do without them. I was fairly neutral about the dressing; which was never called stuffing, as we didn’t put it inside the bird. We always had green vegetables, too, and mashed potatoes – but that was everyday stuff. I did like the relish tray, which was carrot sticks, sweet gherkins, black olives and celery stuffed with cream cheese and walnuts. But the essential foods, the ones that I really looked forward to, were the soft buttery rolls that my mother made from scratch, a piece of spicy pumpkin pie with whipped cream, and a turkey sandwich (made with a homemade roll) for left-overs. My grandfather had what was called a “sweet tooth,” and he liked to have his dessert as soon as the plates were cleared. We always had pumpkin pie and fruit salad, and usually an angel food cake for one of my grandmothers. There was almost always a pecan pie. When I was a child, we had Italian Cream Cake and sometimes a mincemeat pie. In order to take best advantage of this selection, it really was preferable to go for a long walk after the turkey dinner . . . and then have a dessert course. Of course, in those days, we had all day to eat. The only other obligation was the Aggie/Longhorn football game* - a ritual known to Texans, if not anyone else. The day would start off cold and hollow-stomached, and end up warm, cozy and completely satiated. Without extended family, without my native home, without the day off, without football even, I do sometimes wonder if there is any reason to keep celebrating this most American of all holidays. And yet, I can’t give up this beloved ritual. This year, as a grateful Thanksgiving guest, I’m bringing pecan tassies to the communal table. 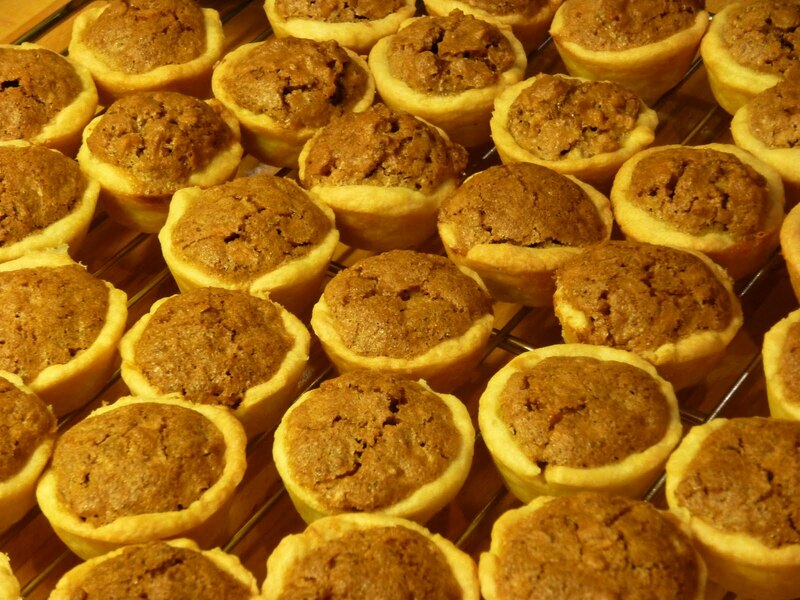 Tassies are a Southern specialty – and basically they are a miniature pecan pie, with a unique cream cheese/butter crust. As far as I’m concerned, they solve the pecan or pumpkin pie debate. Pecan pie is so rich and stickily sweet that you probably aren’t going to have stomach room for both . . . but a tassie is practically bite-sized. If you don’t celebrate Thanksgiving, these are also great for Christmas – or any other occasion, actually. Using a mixer or food processor, blend together the butter and cream cheese. Then add the flour and salt, and mix until thoroughly blended. Form the dough into a ball and refrigerate until chilled -- at least half an hour. When the dough is ready, grease two large mini muffin (or small tart) pans. When you have completed this process, add the pecan filling. Mix together the eggs, butter and sugar with a strong metal whisk. Then add chopped nuts, and stir until evenly incorporated. Fill the individual uncooked pastry tarts with this mixture, just below the top. Don't get them too full, or they will overflow when they cook. Bake in a pre-heated 375F/180C oven for approximately 15 minutes. My tarts actually took 18 minutes, but start checking at 15. They should be lightly golden brown. If stored in a tin, with waxed paper, they will keep well for several days . . . assuming they don't get gobbled up. yum!!! I'm definitely a pecan pie girl. and I can attest, these are delish as I've had them before. mmm, my mouth is watering! Well! Now I know what I'm going to be baking and bringing to work for the share bar in a few weeks. I love pecan pie, but I agree, one slice is almost too much already. These sound just right! I've just been eating one of my own pecan tassies . . . even though I'm having my DINNER in two hours. I knew this would be a good place to come around Thanksgiving! I'd never been much aware of it at all until I started blogging and got to know so many Americans; now I rather vicariously enjoy it. Getting the turkey done not dry: one of the few cooking tasks Tom does (for Christmas) and I happily leave to him. He takes the legs and back off and does them separately. It's brilliant, as it takes so much less time, doesn't dry out and also takes up less oven space. He invested in good poultry shears, which avoid hair-raising stunts with big knives and hacksaws. The pecan tassies look and sound wonderful. 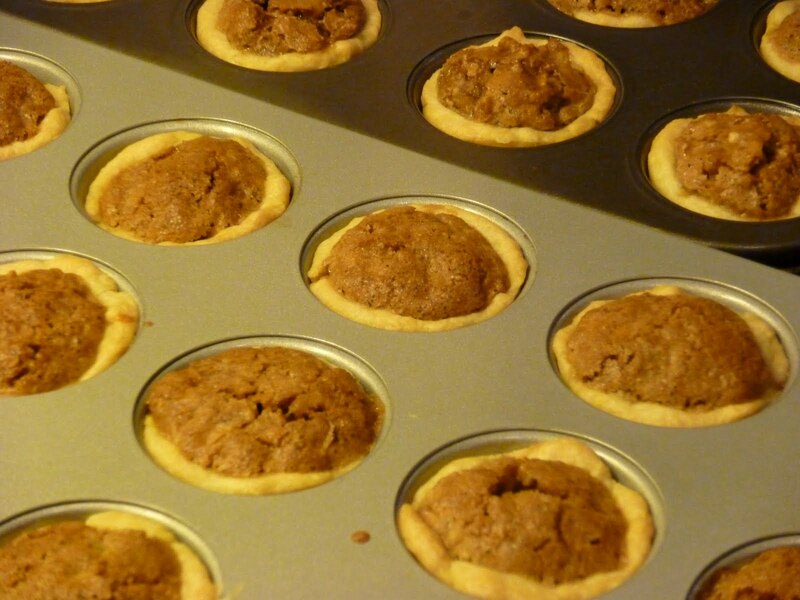 I have a Mireille Johnson recipe for little walnut tarts which is not dissimilar. My mouth is now watering! I have an Aunt back in Texas who made these for us every Christmas. Oh my, they are so good. I didn't know there was cream cheese in the crust! The secret ingredient, I'm sure. Thanks, Bee! pecans are love! i want one right out of the oven.